Do badgers spread Bovine Tuberculosis (bTB) and, if so, is it sensible to kill the badgers to reduce losses to dairy farmers? On these issues, a great argument has been raging for several years but there are now likely to be a series of skirmishes on the ground in West Wales. A few years ago the Westminster government decided against a badger cull but now the decision is with the Welsh Assembly, which has taken a different line. 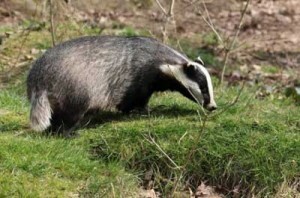 The Welsh Assembly now have authority to cull badgers and have decided to start the process this summer in North Pembrokeshire and small parts of Ceredigion & Carmarthenshire; an area covering a bit more than 100 square miles. This is an area where there is a large dairy industry and the incidence of bTB is high. The process of setting traps is now beginning , though there is fierce opposition from many landowners and animal rights groups. Traps for badgers are expected to be baited with peanuts and the trapped badgers will then be shot. Those who oppose the ban say that the rate of incidence of bTB is dropping anyway and that the danger is not predominantly from badgers; maintaining that 88% of bTB infections are said to come from other cattle (for example see this article on cow to cow infection - here ), and some cases seems to be spread by other mammals as varied as deer, cats, dogs and even alpacas. Some experts say that a cull like this will be counter-productive as the badgers will simply move to other areas and, if they do indeed carry bTB, then will spread it to new areas. The same people also suggest that any benefits are short-lived and not cost effective, aside from the obvious damage done to wildlife. On the other hand Dr Glossop, the chief veterinary officer for Wales, says that the authorities have spent £100 million on compensation to farmers for bTB cases over the last 10 years and need to do something about it. The badger cull might better be described as a badger extermination as the Welsh Assembly is not trying to reduce the populations in these areas but to eliminate all badgers. Unfortunately for this plan, the badgers will probably re-colonise the areas and so the process is not a a simple matter of one-off eradication. It is partly this effect that makes Professor Donnelly say that the effort cannot be cost effective and she estimates that the cost of repeated culls is 2-3 times as high as the hoped-for benefits to cattle farmers and the Welsh Assembly. Immunisation may develop fast enough to give a solution all are happy with - it is expected that oral vaccines for badgers will be available by 2014 and injectable vaccines for cattle by 2015. There is an injectable vaccination for badgers available now. This would also be cheaper than killing. The cull that is now starting is expected to take 5 years so it is possible that it will be replaced with an immunisation program. At the moment there is no sign of any peace or compromise on the matter ; protesters have taken the matter to court, where the Welsh Assembly view has prevailed so far. However, some campaigners seem intent on fighting further including with direct action even though it would be illegal. There is a well-organised protest group in Pembrokeshire called "Pembrokeshire against the Cull" whose website is to be found at pembrokeshireagainstthecull.org.uk. There have also been strong objections to the cull from the Badger Trust and Badger Watch. What do you think? Is the badger cull necessary? I Read your comments and understand that not all farmers a perfect but most of the ones I meet understand lots about wildlife and conservation. You might find this hard to believe I own two Terrier dogs and enjoy my vermin and pest control and have a woodland with a large badger set. I wood never harm or disturbed them because they are apart of that wood which I enjoy very much, What Im trying to say Emry have a bit faith in people. 3) If God had meant there to be trees on the land there would be trees on the land. 4) Trees are no good to me – take them all. When we are told things like this I wonder how much some farmers really observe & understand their own animals, let alone wildlife and the environment. When you keep sheep off a piece of land, trees will grow back very quickly as I have seen on my own land. I have also seen lambs climbing onto the bole of an oak tree to eat young leaves. I have also seen sheep bending over young saplings with their necks & bodies stripping the leaves systematically up the stem; and also seen them eating leaves off a wide variety of mature trees in preference to grass on occasions. I am not a farmer but I have witnessed a considerable amount of ignorance by a small number of farmers about the animals they keep and about the importance of the environment. I carry out vermin and pest control on a few local farms by shooting, I find that the farmer knows best what his problem areas are and what he needs controlled on his farm or land. I have been shooting over 30 years and I am shooting the same amount of vermin and pests as in the beginning, I have seen the ground move around me with rats the moors full of rabbits. If it was left to the town people to make decisions on pest control farms would not exist. So If a farmer requires that badger fox deer rat rabbit and mole are removed from his land it should be his decision alone, most farmers have done farming all their lives so please give them some credit. TB was prevalent in humans when they lived in poor quality damp housing and had very poor diets. According to a Pakistani doctor I met over 20 years ago, who had a lot of experience dealing with TB in Afghan refugees, TB cannot survive in a low oxygen environment – ie. high altitude. With today’s technology, cattle could be treated if they were kept in building fed with a low oxygen air supply. Dairy cattle have been bred for huge milk yields. Nowadays most cattle are fed 3 species of rye grass and are kept in cold damp sheds over winter. Some studies have indicated that TB has increased in areas where farmers are using corn based feeds for their cattle. Corn based feeds are, apparently, very low in trace elements. Other farmers country wide have treated their land with powdered rock, high in trace elements. These farmers, according to the company that provides this service, have had no cases of TB. Could it be that a lack of trace elements on the land are contributing to the high numbers of TB experienced in some areas of the country? Farmers are always looking for scapegoats for their own self induced problems. The natural balance has been upset because all major predators, apart from Homo sapiens, have been eradicated from our island. No wonder badger, deer and fox numbers are increasing. Firstly, the scientists responsible for Randomised Badger Culling Trials (the most extensive, peer-reviewed and robust data yet obtained on this subject) have on June 10th categorically restated their conclusion that “the culling of badgers can make no meaningful contribution to the control of Bovine TB in cattle in the UK” If this doesn`t speak clearly enough, it should also be noted that the recent released DEFRA figures show beyond all doubt that the number of cattle slaughtered due to TB, the number of new herd breakdowns, and the number of new confirmed TB incidents are all dropping, Without a badger cull, which both Dr Glossop and Elin Jones, rural affairs minister, seem to be choosing to ignore. It’s quite obvious that the main cause of the spread of bTB is through intensive farming. The farmers are using the badgers as a scapegoat – blaming them for what (they surely know) they are doing wrong. The best thing for all of us to do is to boycott dairy products. The are more badgers because the goverment didn’t do a cull. Now there are more around the place that they becoming a problem on some of the the country road. This is where set are in the side of the banks and verges so may cars are having to pull out into the middle of the road. This because wher they pull all the old bedding out which builds up making mound on the side of the road. Also when they fall from the high banks into the roads. Come down some of the country roads to see this for your self. Its not only dairy farmers that have problems with badgers beef have to have one week old calf killed because its picked up TB from the badger. If the cow thats in calf and it has TB that means that unborn calf will have to be killed too. So please don’t its just think dairy farmers that have problems. All farmers have the problem. Meanwhile, last month in East Sussex, two policewomen drove up, all very sober and business-like, and disappeared into the undergrowth to have a look at our neighbour’s woodland. Someone had reported that the badger sett had been dug. “To interfere with a badger sett is “an offence in law”.” Move over here, you Welsh badgers, all is forgiven! Culling of wildlife is not cost effective and won’t bring a short or longer term solution to farmers involved in frequent herd breakdowns who are desperate to try anything. This issue is now getting out of hand. What is needed is for all resources to be put into a vaccination programme for cattle (there is a BCG vaccine available already) and the phasing out of the existing testing regime. It would appear that the main reason for the reluctance to start a vaccination programme for cattle means that the existing skin test would have to be phased out, as vaccinated cattle would show up as positive reactors. However, the skin test is not a perfect test, and yet the overall TB status off an area is based solely on the results of this test. The test indicates that the animal has mounted an immune response capable of recognising M. bovis and does not conclude actual infection. It means that animals have been exposed to a bacterium that can cause TB at some point in their life (or have been vaccinated!). Current EU regulations mean that vaccinated cattle cannot be exported to the rest of the EU, as current tests cannot distinguish between infected and vaccinated animals. In reality this does not matter for meat and dairy products as pasteurisaion and cooking kills the bacteria that causes bTB (yes lesioned cattle do go into the foodchain once affected areas have been removed). The only products at any risk would be those used in their raw state. Many countries, where bTB is endemic or only controlled, export products to the UK. The real reason for the existing eradication policy in the UK is to protect the market for live exports of cattle, and to comply with existing EU regulations, which insist on its countries achieving TB-free status. However, if one looks at the export figures for Great Britain over the last few years it is difficult how such a decision can be justified in cost terms for the UK. The numbers and value are falling year-on-year and, even more surprising, is the fact that the value of this market is considerably less than the annual costs of the existing eradication policy for bTB. Surely this makes a vaccination programme for cattle viable and an appropriate case should be made to the EU in this respect? Of course it would need to be approved by the politicians, farming unions, veterinary professions and EU – and here we hit the stumbling blocks ….